The 1932 Olympics, hosted in Los Angeles, coincided with the first graduating class at Leuzinger High. In exchange for volunteering the campus for staging in the Olympic Games, the school was allowed to use the Olympics logo and call itself the Olympians. When The Summer Games returned in 1984, The USOC tried to take back the name and rings, but the school gave them a copy of the agreement written in 1932 giving the school permanent use. 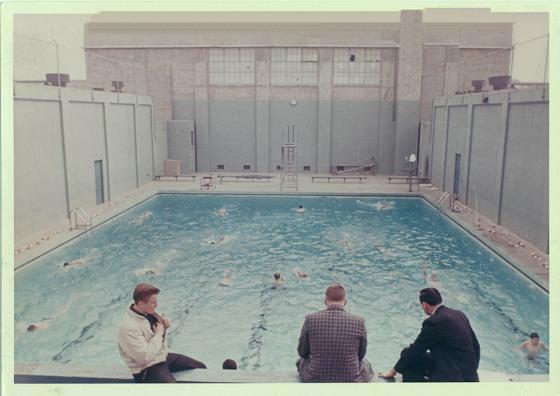 The Swimming Pool was originally built and used for The 1932 Los Angeles Olympics. Retired Teacher and Counselor Mike Milling says, "Good to see Don and the water polo team. One thing; Leuzinger High School's pool was 25yds long. Olympic-sized pools are 50 meters long." Time has taken the swimming pool away along with other venues. All that's left are the memories we share, the mascot name and our school logo.